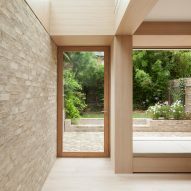 Architecture studio Erbar Mattes has added a limewashed brick and glass extension to a house in London's Crouch End, creating a bright and spacious living area for a family of four. The London studio extended the rear of the early 20th-century mid-terrace house to increase the ground floor living space. The garden room comprises a kitchen, dining and playroom for the family's two young children. "The former ground floor layout was biased towards the front of the house," said the architects. "The brief was to reconfigure and extend the ground floor in order to improve the connection to the garden." 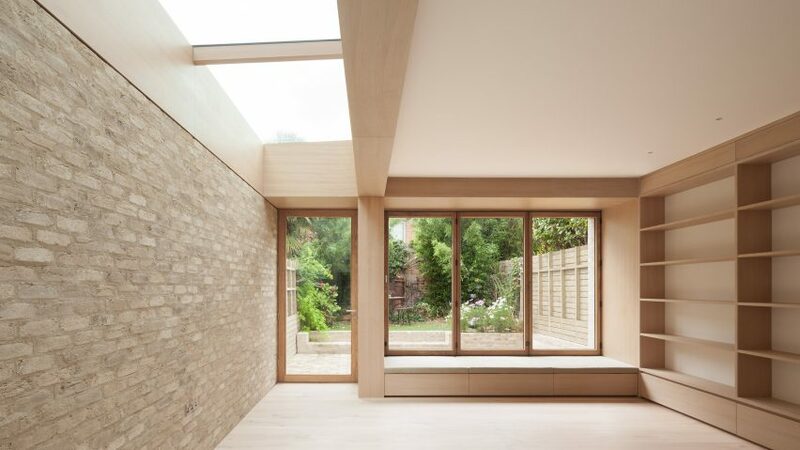 "The new garden room inverts the former street-facing layout," they added. "Benefiting from the afternoon light, this space forms the new heart of the house." The architects removed the existing rear and side walls to insert the limewashed brick volume, which spans the full width of the three-storey house. They also replaced an old bay window with folding oak-framed glazing that faces out into the garden. A deep window seat with built-in toy storage corresponds with the depth of the bay window on the floor above. 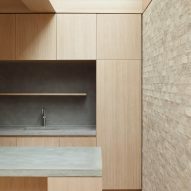 The kitchen is set towards the back of the space and features worktops made from single concrete slabs, as well as oak veneer cupboards. 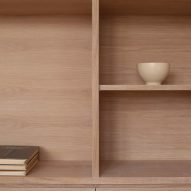 Oak veneer shelving has also been added to the wall of the lounge area, matching the kitchen cupboards and white oiled oak floor boards. A large skylight that fills the space between the old party wall and the original flank wall, helps to naturally illuminate the space. Residents can access the garden via a large oak-framed glass door. Here, a patio and steps covered in herringbone-patterned brickwork lead up to a raised lawn. In addition to the rear extension, Erbar Mattes has reinstated the front room facing the street to its original layout. Architects Holger Mattes and Demian Erbar previously worked for David Chipperfield's firm before co-founding their own office in 2015. Photography is by Ståle Eriksen.